Elizabeth Arden Skin Illuminating Brightening Day Serum With Advanced MIx Concentrate 30ml, is a lightweight facial serum to brighten and illuminate the skin. A concentrated day serum with Advanced MIx Concentrate, encapsulated Niacinamide and Vitamin C which combined minimise the appearance of dark spots, redness and discolouration whilst smoothing and illuminating the skin. Excess pigmentation appears minimised, future dark spots are prevented and skin's texture is more even and smooth. Ideal for all skin types, the serum supports the skin’s own natural collagen and elastin matrix to give skin a smoother, brighter look. Treatment Type: Anti-Redness, Brightening Facial Serum. 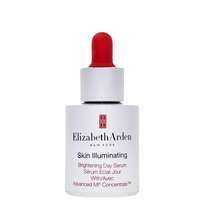 Elizabeth Arden Skin Illuminating Advanced Brightening Day Serum 30ml / 1 fl.oz. Elizabeth Arden Skin Illuminating Brightening Day Serum With Advanced MIx Concentrate 30ml was found on 4 websites and was price compared using EAN: 0085805541958. The cheapest Elizabeth Arden Skin Illuminating Brightening Day Serum With Advanced MIx Concentrate 30ml is shown as the main item, prices range from £55.00 to £55.00, excluding delivery. Price comparison based on price and delivery charges, with any valid discount codes being applied, is shown in the table above. Prices and information correct at the time of publication.